We've got an amazing range of food available for you at the Chilled in a Field Festival Street Food Village. Offering a great range of high quality, reasonably priced festival food to suit all ages, appetites and special requirements, you won't go hungry! ​Their ethos is to source local and free range ingredients wherever possible, with an emphasis on animal welfare. With a focus on the environment, they use recycled and compostable catering disposables. They also have the very important job of keeping our crew well fed through the festival and during the build up. ​Dragon Pizzas is a wood fired pizzeria, serving a range of halal, vegan, dairy free, gluten free options. All pizzas are made fresh right in front of you so you can see exactly what goes on it! They even use recycled wood briquettes made with recycled wood from furniture factories. Your pizza will also be served on pizza plates made from recycled waste sugar cane and are biodegradable. These take up a fraction of the space in bins compared to normal pizza boxes. ​Supernatural Catering (formerly Cosmic Caravan), will be providing gourmet selection of vegan and veggie food to our customers for the festival weekend. They are passionate about providing healthier options to events and you will be able to savour a menu specially selected for Chilled in a Field. ​A new addition to the festival for 2018 and trading from a beautiful caterpod, Isabel's Bakehouse will be cooking up a range of sweet and savoury crepes. Made from fresh ingredients, crepes make the perfect lunch or indulgent snack. You will also have the option to savour their selection of award-winning hand made cakes (including a very chocolatey, gluten free brownie!) and popcorn pots (also gluten free) along with a selection of hot and cold drinks. Your chance to indulge in exceptionally high quality local fish caught on the Sussex coast by ‘day boats', using fishing methods that are the most sustainable in the area. Olly's Fish Shack aims to give customers the feeling they have just found a special place to eat - like somewhere you might get recommended on holiday by a friendly local, a buzzing seafood shack on the beach in Whitstable. The dishes they create are fun, simple and delicious. This can be a plate of "Next Level" Fish & Chips with homemade tartare sauce or harissa mayo and fresh lime, or one of their famous fish rolls. They also do an epic Ensenada-style fish or shrimp taco with sweet potato fries! A resident trader at Street Diner food market in Brighton, you won't be disappointed! They also boast a celebrity chef amongst their customers - one that knows his fish - Rick Stein! 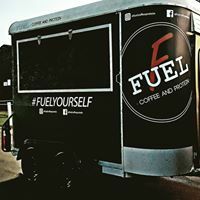 Fuel have painstakingly sourced what they believe is the perfectly balanced coffee blend, smooth and full of flavour, ethically sourced from the finest coffee growers of South America and Asia. A big full bodied espresso with a naturally sweet caramel flavour to wake you up in the morning. Added to that, they will also be offering a range of protein shakes to fuel up after a long night dancing (choose from Snickers, Oreo, Banana Malt or Strawberry Cheesecake). They will also have a range of super healthy juices on offer. You will just have to try for yourself!